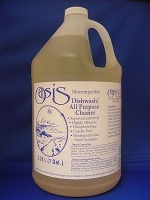 For hand dishwashing, general cleaning and hand soap. Ideal for camping and travel, it can also be used for hand laundry or (at low dilution) body soap or shampoo.The special formula has no sodium salts. Clean up the house, and then toss that bucket full of dirty water around your plants. They will love you for it! Beyond Biodegradable…Oasis biocompatible cleaners not only break down, they break down into good things! Oasis™ wash water contains no plant toxins – our unique formulas biodegrade into plant nutrients! Ordinary biodegradable cleaners contain the plant toxin sodium and sometimes boron and chlorine as well. Oasis enables the sustainable reuse of wash water (greywater) for irrigation. By recycling water and nutrients, natural waters are kept pure. Oasis™ is also suitable for septic tank or sewer disposal. Ingredients: Purified water, ammonium alkyl ether sulfate, linear alkyl sulfonate, citrus oil.